In this way, the old lady lived in the lumberjack's house. Winter passed, and spring arrived. The flowers began to blossom. The old lady gratefully said to the lumberjack: “I'm truly a burden to live in your house for such a long time. I really thank you for your kindness. The weather has already turned warm, and I should leave.” The lumberjack replied: ”You have no children, and I have no parents. That would be nice if we three can live together? Please do stay here with us!” The old lady was moved and thought she finally found someone she could trust. Then, she said to him: “To be frank with you, I was a gatherer of medicinal herbs. I've saved many people's lives in the past. I wanted to hand down my knowledge, but I couldn't meet a suitable person. My memory is getting weaker and weaker. Pretty soon, I'll forget all I know about medicinal herbs. You've taken care of me without any ulterior motives. I really don't know how to thank you¡K” The lumberjack answered: ” We don't take care of your for any repayment. As long as this household has anything to eat, we certainly won't let you get hungry. So please stay with us!” The old lady felt touched and said: “Thank you so much, I will regard you as my son and I live in my son's house.” As a result, the old lady started to spend her rest of life with the lumberjack's family. Three happy years passed. One day, the old lady asked the lumberjack to carry her up into the mountains. She started to teach the lumberjack how to recognize all the medicinal herbs. She pointed a plant with white, purple-striped petals near a big rock. She asked the lumberjack to uproot the plant, and told to him: “This is the herb that can cure cough and fatigue caused by overheat of the lungs. Do you know why I've waited till today to teach you about herbs? For so many years, I never met a hard-working and good-hearted person until I found you. You truly understand my heart and mind, so I will name this plant “Zhi Mu” (knowing-the-mother).” From then on, the old lady taught the lumberjack many skills to distinguish medicinal herbs. The lumberjack didn't chop wood any more but concentrated on studying herbs. He always obeyed the old lady's instruction to healing people and save lives. 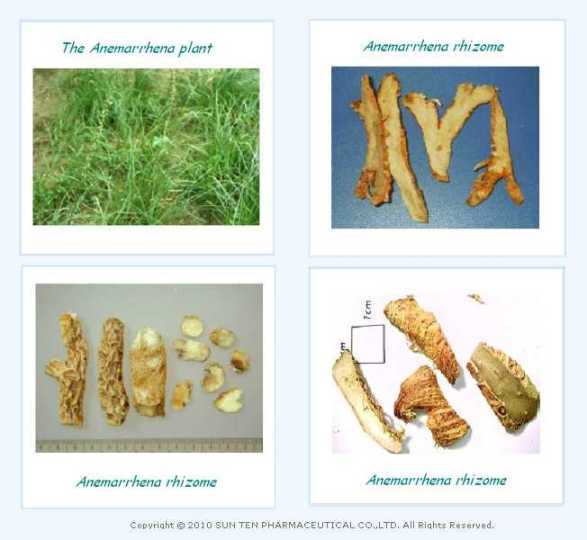 Anemarrhena (Zhi Mu) is the dried rhizome of Anemarrhena asphodeloides Bge. (Liliaceae family). It has bitter and cold properties and with slight aromatic scent and is in slightly sweetish and bitterish taste. It enters through the lung, stomach, and kidney channels. Contraindicated in cases of diarrhea due to Spleen deficiency.